The vacuum chamber is done, now we need to put in our piece of wood and weight it down, then fill the jar w/ resin. 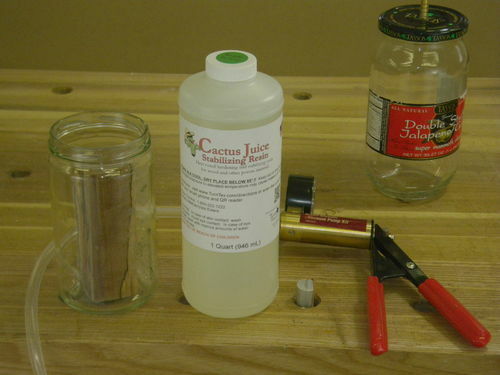 I use Turn Tex Cactus Juice. 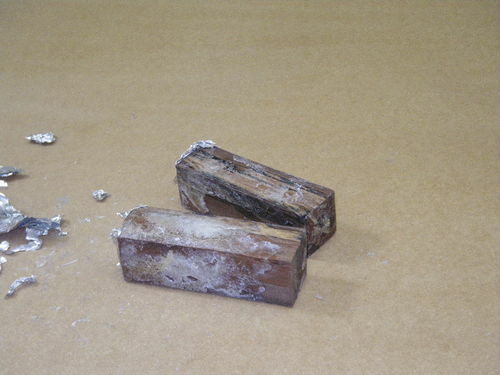 Make sure that the resin covers the top of the block of wood by at least 1/2” or more. Then pump the brake bleeder until you hit 25 on the guage. This will immediately cause the resin froth and foam as the air leaves the cellular structure of the wood and is replaced by resin. I like to leave it in the resin for at least 24hrs, longer is better. 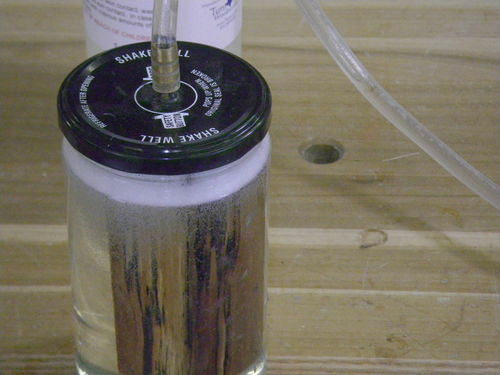 If your resin level drops to below the top of the block of wood you should release the pressure and open the jar and add more. Then re-apply the vacuum to 25 on the gauge. If you are losing pressure in a short period of time then probably the seal on your jar is not good. The only recourse is to make another jar. I typically get about 2 years out of jar before the seal fails, not bad considering the cost. Now it is time to remove the block of wood. First release the pressure on the brake bleeder, there is a little pin on the under side of the bleeder just push it and that releases the pressure. You won’t be able to open the jar unless you release the vacuum completely. 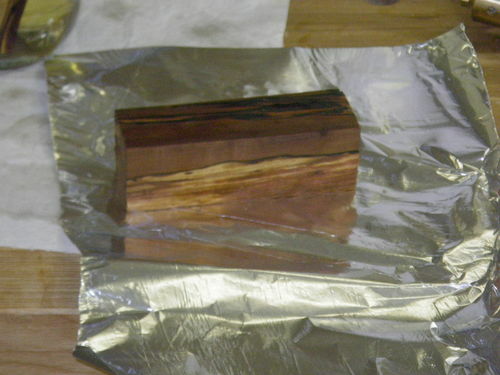 Pull out your wood and wrap it in foil. Now we have to bake it in order to set the resin. 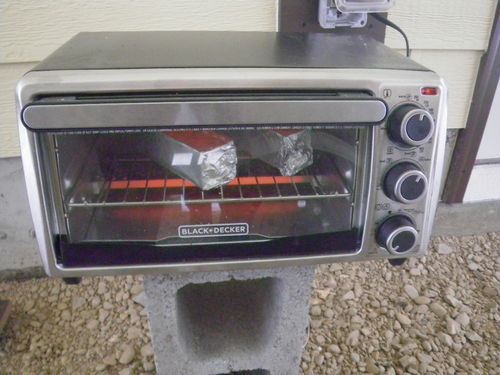 I use a toaster oven for this and do it outside. The resin gives off some chemical odors that are not really pleasant. Keep everyone in your household happy and do it outside. Bake it at 200° F or 93°C for 2 hours. 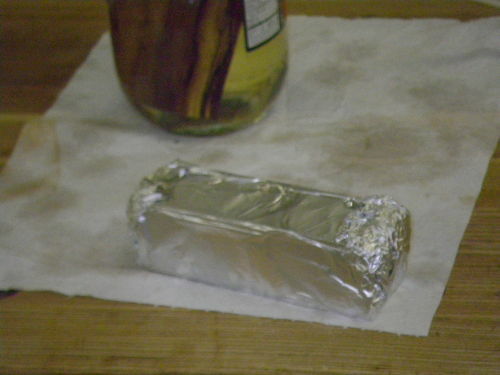 When it is done, let it cool thoroughly, then remove from the toaster oven and peel off the foil and it is done. It will have some hard plastic like stuff on the outside there will be bits of foil stuck to it but, no matter, that will come off on the lathe when I turn it into something useful. 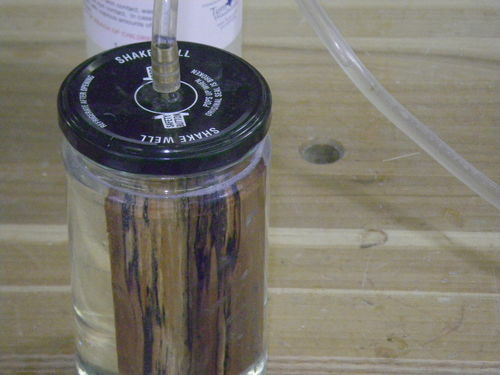 That is the complete process that I use for stabilizing wood. After you acquire the supplies and build the vacuum chamber it is pretty easy. Have you had any issues with glass jars imploding on you? I’ve been looking for a way to do this cheaply, but having glass shards fly into my face isn’t very appealing. Is the unused resin reusable? Can I pore the resin from the vacuum jar back into the bottle and use it again? grfrazee, no I have not. Pickle jars are designed to withstand some amount of vacuum pressure. I can’t say how that compares to the amount I use in this process. I can say that I never had a jar implode. One thing I do is thoroughly inspect it before it becomes a candidate for a vacuum chamber. You certainly wouldn’t want to use a jar that has chip or crack. Also do this in place where it isn’t going to get knocked over or fall. Bluepine38, Yes, I moved into the shop around Christmas. I’m still not organized but I am working on it. Thanks for writing up the process. Very easy to follow.